Comparison of a Cornish Rock hen to a Production Red hen. Fall is traditionally the time of year when extra livestock on a farm or homestead is butchered. The simple fact of the matter is this…farm animals are typically born in the spring and grow all summer and into the autumn, but farmers don’t always have the extra feed to nourish those animals over the winter. Extra males are the first to go. They create a commotion as they mature and fight for mating rights. Perhaps a new stud is kept and the old one is sold or butchered, but most will go on the table while they are still young and tender. Next are the older females that aren’t producing enough milk, eggs, or babies to justify keeping them around. A farmer can’t be sentimental about his dear old milk cow. If she doesn’t produce, she doesn’t stay. Sometimes these ‘extras’ are lucky enough to be sold off to a new farmer or family that can’t afford an animal in prime condition. Some of the exceptions are horses, oxen, and cattle. Working animals such as horses or a team of oxen are kept until they are no longer able to pull their weight around the farm. Then they are fair game for butchering too (at least back in the day they were). Cattle are normally kept until the second season to reach a good butchering size. We only have a bit over an acre of land, so cattle, pigs and the like are not feasible here. However, I raise all of the poultry that we eat and I butcher them myself. I consider it my responsibility to provide the best life for my animals and the best end of life too. Their death is as quick and as painless as I can make it. But that doesn’t mean that I enjoy this responsibility. In fact, it is a very sobering part of my homestead life. Our farming forefathers would often eat extra poultry during the warm summer months, since a chicken or duck would provide enough for a nice dinner without leftovers. There usually was no refrigeration for keeping extra meat from spoiling, so larger animals like pigs and cattle were typically butchered late in the fall or early winter when there was natural cold storage. I also butcher my poultry throughout the year. As I notice egg production tapering off, I try to isolate older hens to see who is still laying…and who will be culled. It’s never easy to end the life of one of my laying hens. They all seem to have their own little personalities and, well, I enjoy having them around. But I can’t afford to provide organic feed for hens that aren’t laying more than a couple of eggs a week. Last year I raised turkeys and I found it even more difficult to butcher them. They were inquisitive birds and they followed me around the garden like pets. And they definitely knew I was up to no good when I took a member of the flock away. It was tough. This year I raised ducks for the first time since I was a kid. They are harder to butcher too. They just seem a bit smarter than the chickens, and they have such deep, dark eyes. They know something is up when I take a member of their flock away. When I know that some of the birds need to be butchered, I keep an eye on the weather forecasts, watching for a cool day so there won’t be as many flies and bacteria won’t multiply as quickly. I usually know a day or two in advance when I am going to butcher, and how many birds I will be processing. The thought is on my mind every time I walk out to feed, water, or collect the eggs. My heart sinks every time I look at the unlucky members of the flock. I try to watch to see if there are signs that one male is better suited for carrying on the flock than the others, making my mental preparations. The night before butcher day I might separate the ones that will be butchered, but not always. I know you are supposed to stop feeding them and just provide water, but I have gotten pretty good at butchering without spilling the contents of the intestines. So I usually just catch the victims in the morning and put them in a cage until I’m ready. This is the point when I get knots in my stomach, or maybe they’re butterflies. Whatever it is, I don’t like it. I set up the scalding pot and let the water start heating. The table is pulled out, knives and hatchet sharpened, chopping block wiped down. A container is readied for the feathers and entrails. I cut one corner of a feed bag off for putting the bird’s head through and restraining them. This allows me to hold the animal safely while I chop off the head and let it bleed out. It protects my arms from their toenails and keeps the meat from getting bruised. I move through these preparations methodically, finding solace by moving with purpose. When the water in the scalding pot is hot enough, I know it’s time to get started. Once the animal is dead, I really have no problem with the rest. At that point it is meat, not a living creature. The first one is the hardest and I try to move through the steps methodically and efficiently to get the job done as quickly as I can. My ultimate goal is to make each death as swift as possible so the meat is processed and chilled right away. For complete instructions and tons of photos detailing the process of butchering, check out my posts How to Butcher a Chicken and How to Butcher a Turkey. I’m glad to hear from you and glad to be of a little help. I do have a post dedicated to butchering a duck, just in case you would like to see the process from beginning to end. Best wishes with your duck processing project and just let me know if you have any questions. We have 11 Cornish Rock X nearing harvest time. About half are ready to go right now. 21 more in the brooder. We did turkeys last year. Hatched them from eggs. All 3 were toms. Lots of fighting between them. Two of them ganged up on the third and really injured him. I ended up having to butcher him by myself on very short notice, as he was not going to make it. Didn’t have time to prepare myself for it! Kind of hard to handle by myself. The other two lasted until Thanksgiving. I had help with those. Much easier. We smoked one and roasted one. Very nice to have grown our Thanksgiving dinner from the egg! My older granddaughter (12) loves to raise the animals, but won’t take part in the ‘harvesting’ as they are required to call it in 4H. The younger one is 5, and is right there in the thick of things, wanting an anatomy lesson as we go. You can ask her: What do we do with the chicks? ‘We eat them!’ What do we do with the bunnies? ‘We eat them!’ No problems there! That’s awesome! I think that the younger kids are when they are introduced to the notion of ‘harvesting’, the easier it is for them to accept. I knew from a pretty young age that our cattle and pigs were going to the butcher shop. I do remember feeling bad for them, but I don’t remember getting upset about it. I’m hoping to get some heritage turkeys this year so I can hatch and raise my own. How cool that you were able to raise your own turkey dinners 🙂 I raised the Broad Breasted turkeys one year and really enjoyed the experience. Although I don’t think I want to butcher 15 turkeys in one season again any time soon! Whew…it is a big job! I’ve read that the turkeys will pick the male that is lowest in the pecking order and beat them up. This continues until only one Tom is left. That’s probably why you had that issue. Best wishes with your Cornish X and all the rest of your animals this spring! Thanks for sharing! Why do you stop feeding the, before the butchering? My mil suggested a corn feeding is that good for the meat? If you take away feed overnight before butchering, it cleans out most of the feces in the intestines. This way there is less chance that you will get poo on the meat. Perhaps some people feed corn because it is coarse and cleans out the system…I’m not sure about that one. I have butchered after withholding food, and I’ve butchered them with their bellies full. I’ve had enough practice that I can almost always remove the innards without getting feces on the meat. But every once in awhile the intestines rupture and I end up rinsing the carcass in bleach water then cold water to clean it up. Thank you for sharing this..we recently moved to a rural area with some acreage. We just purchased our first chickens. We have only had them a few days, but I can already tell it will be difficult when the time comes. I will certainly remember this post when it comes time in hopes it will remind me that this is what we have to do in order to be more self sufficient. It is difficult. They all seem to have their little personalities. But you’re right, it’s part of the lifestyle. What a thoughtful, measured and informative post Lisa Lynne. As a child – we harvested our meat in the fall. Many, many chickens, ducks, turkeys, geese and (off farm) pigs, went under the proverbial knife to supply our family for the winter. I remember our father – chopping off the heads. Our job – the kids – was to gut, then scald, then de-feather ….. It was part of our life. And part of theirs. The life and death and eventual dinnering of each of these creatures was celebrated. We were so thankful. We knew each of them. We knew what it meant for us to eat them. We were grateful. As an adult – many years ‘separated’ from the farm life I loved – I am re-owning my food. This past year – a friend of mine raised her own turkeys. She knew them. She butchered two of them on her own – it was not pretty. She was up north & her family would not take part – though they did eat the meat. 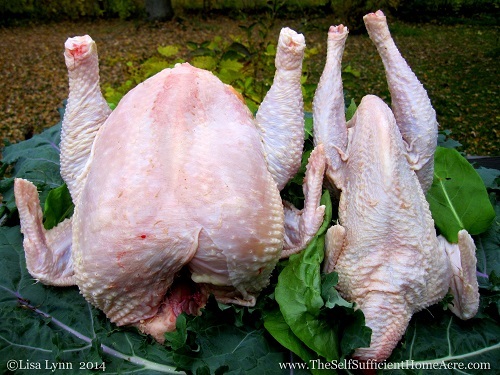 Later – with two more birds to slaughter – I went with her to a butchering workshop at a local organic farm. They were wonderful, caring, committed and knowledgeable. We used a different though similar, process – the turkeys or ducks or… were wrapped in a foot wide strip of carpeting and laid over a chair. A bucket was set below the head to catch the blood. One person held the bird down – with legs in one hand – pulling up – the other hand holding the body in place. The second person – held the head – really the beak – pulling out so gently – exposing the carotid, which was gently slit…. the beak was held as the bird bled out into the bucket….. After that – as you say Lisa Lynn – it was just meat………. I helped raise it. I helped kill it. I helped dress it. I helped cook and it eat. I am blessed. Thank you for helping to bring us back into the world. I’m always so happy to hear from others with similar experiences and beliefs!